During the Hari Raya holiday, we brought the kids out to Sentosa for some Piratey fun! 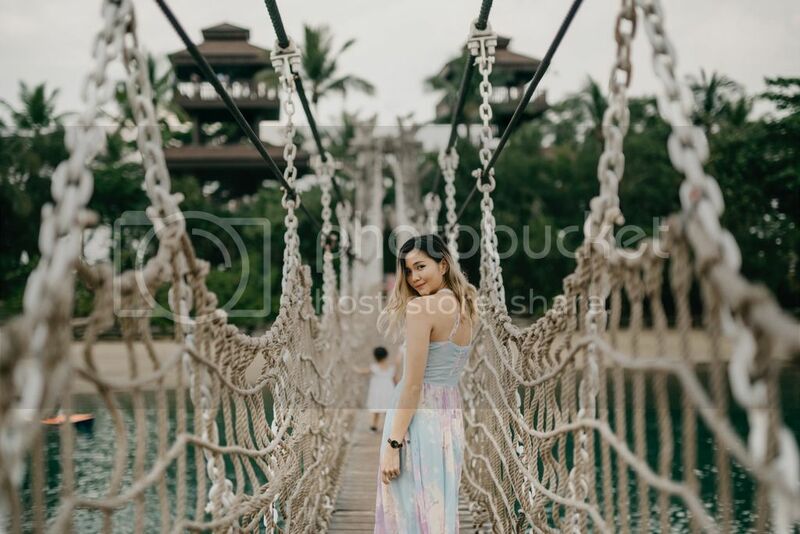 For months, my girlfriend Hazel & I have been wanting to bring the kiddos to Port Of Lost Wonder at Palawan Beach for some splashing fun and also check out what other activities they have there & we finally got round to it on Hari Raya! Pretty bad choice to go on a Public Holiday though. The queue for the monorail was snaking long. Good thing we could jump to the priority queue cause I'm pregnant and we've 3 tots with us! If you're planning to go there on a weekend or P.H, I'd recommend booking tickets in advance first or else, like us, you've to be put on waiting list. Thank goodness we managed to go in even though there were 20 families ahead of us! While waiting for our turn to enter, we headed to the beach, got some beach mats and toys for the kids and soaked up some sun! Joell happily soaking the kids with the water "gun". & my big kid, Shane who bought a kite for himself cause he's never flown one before. It took about an hour? Before we finally got the call to go in! Quite fast considering that it was about 2 by the time we got there and we weren't expecting to enter anymore. But hurrah! The awesome thing about POLW is that adults get to go in for FREE!! Each kid is $15 and upon admission, each kid gets a port pass and 100 curio coins which you can use at the various stations. Advance booking online is only an extra $1 per kid! The Curio Exchange (I took this when we were heading home)! This is where you get your wristbands for admission, port pass etc. Activities POLW had to offer for that day! The kids were completely in awe of the giant pirate ship water playground! They were so excited they wanted to run right into it! While finding a spot to place our stuff, we passed by "Just Wonder"
The swim shop in POLW that sells whatever you may need. Sunblock, soaps and shampoo, board shorts, you get the drift. & old school toys! The definition of real fun! Apart from the pirate ship playground, there was a foam pool for a bubble party! To enter, you had to "pay" 30 curio coins per kid! Ade took it a little too seriously and started "washing" her brother's hair. hahaha! Dray wasn't too pleased about getting foam piled onto his head though. Parents take note though, some kids can be quite rough when it comes to play. A couple of caucasian boys were literally fighting, my friend managed to call the staff on duty to stop them in time. One boy had the other kid's head in the water & the man outside of the pool, nearest to them didn't even bother lifting a finger to do anything!! Adults these days! There I was yelling at the boys to stop fighting ( I couldn't get in between them and break up the fight cause I'm pregnant) & this nincompoop just watched on! You could only imagine how appalled I was. Just because it isn't your kid doesn't mean you don't stop a fight when you see one?! I'm sure you'd want other parents to do the same for you if your kid was getting punched right? Argh, just the thought of it pisses me off. ANYWAY, back to the topic - Since it was Hari Raya, the kids also got to get messy painting a giant Ketupat. This activity needed no curio coins but the sand was burning hot! I don't know how the kids stood there and painted, I was hopping around just trying to take pictures. Not sure if the girls got the point that they were supposed to paint the ketupat not paint themselves! What's an outing without a family shot? I really should invest in a full swimsuit for my preggy belly though. I've too many bikinis and not a single proper swimsuit. heh. No water playground's complete without a giant bucket of water pouring down on you! & Drayden, well, he's never pleased with such things. hahaha. In case you get hungry, you can always stop over at Port Belly for a bite or some drinks! We ordered the family platter which was just enough to fill our tummies but not too full so we could head back into the water again! Their Fish & Chips looked really good too! To deter the kids from running straight into the water after their meal, we brought them to the Pots & Plants station where they got to pot their own plants! This activity required 80 curio coins! & dig it out to transfer to the bigger pot! Flatten and pack the soil! Almost impossible to get a nice picture of all three kids. Rascal spraying water at others. She said her favourite part of the whole outing was that she got to spray water at kids with the water "gun" when they were sliding down the slide. & while waiting for the rest to finish their shower, the kids could indulge themselves in a game of hopscotch or..
Have fun building a fortress with the large "bricks" & tubes! & the day ended with a boogie from the POLW staff! This picture pretty much sums up the entire day at POLW! Fun for both the adults and kids! Shane & I really like the whole atmosphere there, it was very "chill" & we'd definitely bring our kids over again!